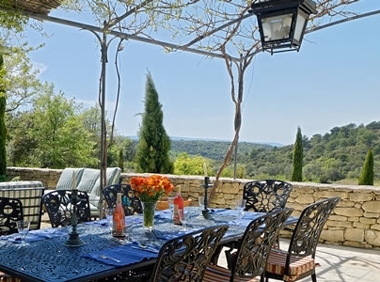 Possibly the quintessential Provencal villa, Mas Du Luberon could easily come with a guarantee, “return from your holiday relaxed, with your batteries fully re-charged or your money back ...even with pre-schoolers in tow!” Set amongst 20 hectares of rolling countryside and Cypress trees, this elegant "Mas" is the whole package. Having been painstakingly restored, it offers all the contemporary features you could hope for in a luxury villa and with its large outdoor space, enclosed pool and kiddie paraphernalia, it’s exceptionally family friendly too. Accommodation is for 14 in three self-contained sections, perfect for larger families or families holidaying together. Area one is on the ground floor and comprises a kitchenette, sitting room, bathroom, shower room and two bedrooms including a double and large bunks room with 4 beds. 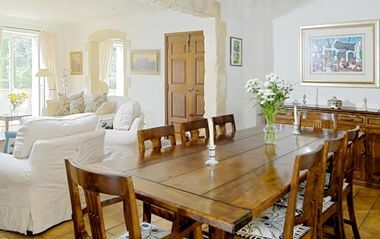 Area two is in the main part of the villa and features a large, very well equipped kitchen, sitting room, dining room, study/library, laundry room and downstairs w/c. Upstairs, there's a double and twin both ensuite and a very large ensuite master bedroom with dressing room. 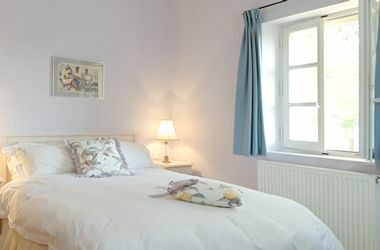 Area three is located in a separate cottage with open-plan kitchenette, lounge/additional sleeping area (two single beds), a bathroom, double bedroom and private terrace. 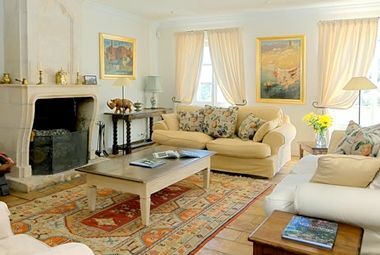 Design junkies will appreciate the many original features of the property including beautiful stone fireplaces (complete with fireguards), exposed beams and a fabulous Roman bassin. Kids will love the selection of games (indoor and pool), satellite TV (with English channels) and library of DVDs ,and parents will appreciate the comprehensive list of baby gear (see grey box below). 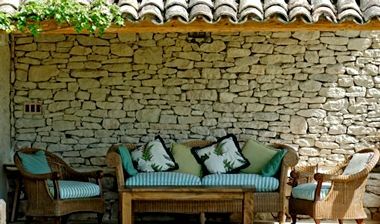 Without doubt, everyone will adore the luxury of lazing by the heated pool on a padded lounger soaking in the setting with impressive honey-coloured stone villa behind and beautiful Provencal landscape in front. The fact that, with a big enough group to spread the cost fully, you could have paid the same for a mid-market package holiday, makes it all the more fabulous! If you can tear yourself away there’s plenty to do. Countless rural walks and hikes lead to beautiful vistas of the Luberon Valley and its dramatic hilltop villages. 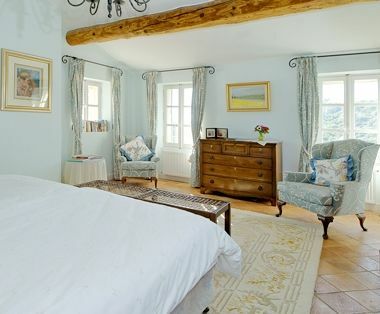 The Mas is Ideally located for exploring Bonnieux, Apt, Isle sur La Sorgue and Roussillon. The villa management company can arrange nanny services and day excursions such as an F1 experience, traveling to the Var region; (home to an FIA approved circuit), private art and cookery classes. There are also balloon rides over the Luberon, golf, horse riding, cycling and even luxury yacht hire. Mas Du Luberon is located 3km from the village of Bonnieux a village known best for its dominating church tower There are fantastic views from the church but those with buggies be warned, there are 86 steps! If that sounds a bit too much like hard work there is plentiful choice of eateries. Apt, a fabulous market town is a little further afield but well worth a visit. The new part of the town is fairly industrial but the old, walled town with its narrow winding streets is beautiful. Getting There: The nearest airports are Avignon (50kms), Marseille (90kms), Montpeiller (112kms) and Nice (160kms). Use www.skyscanner.net to obtain details of flights to these airports. Low occupancy discounts are available for groups of 8 and under. 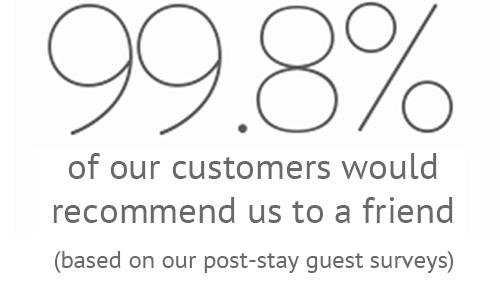 Sleeps 12 in 6 bedrooms plus infants. Groups of 9 or less can receive a lower rate. Please enquire for details. Airports are Montpeiller (112kms) and Nice (160kms). 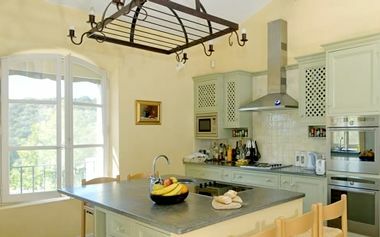 The property has its own salt water swimming pool which is both heated and enclosed (stone walls). babysitting/listening and child day care is available on request. Baby gear provided includes: cots (travel), highchairs, baby bath, baby bouncer, baby monitor, steriliser, potty, stairgates, bed guards, socket covers, plastic crockery, plastic cutlery & sippy cups etc. A selection of games & pool games are provided. Pre arrival shopping available on request. Day care available on request. Private chef available on request. Set in large enclosed grounds.